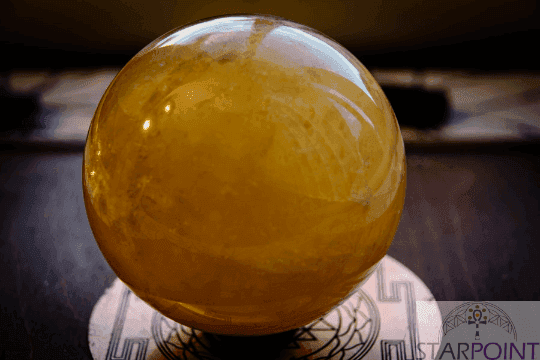 This Golden Calcite sphere is 3 inches or around 8 cms in diameter, it weighs 651 grams and is an excellent stone for meditation and attuning to the higher mental planes according to metaphysical authors of crystals. Calcite brings hope and motivation into your life. It combats laziness helping you to become more energetic on all levels. 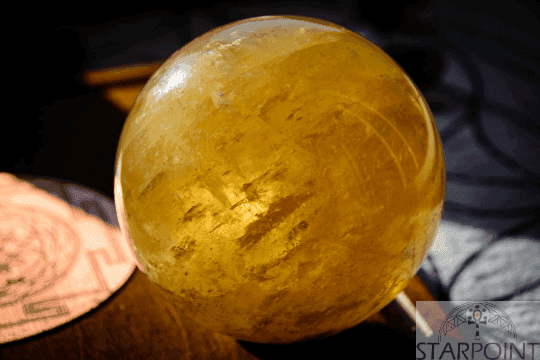 This calcite sphere is 3 inches or around 8 cms in diameter. It weighs 651 grams. Gold Calcite is excellent for meditation and attuning to the higher mental planes. 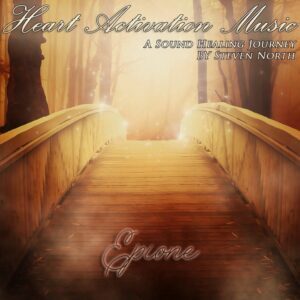 It instils mental alertness while it grounds the higher mental energies to the physical realm. Placed on the Solar Plexus chakra gold calcite will help your digestive system, diaphragm and skin. 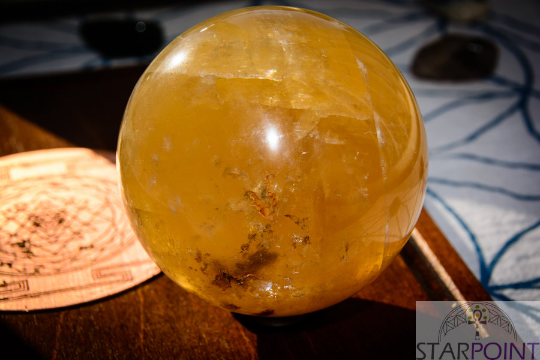 Gold calcite will help you relax but it will also give you energy to move forward with your life. 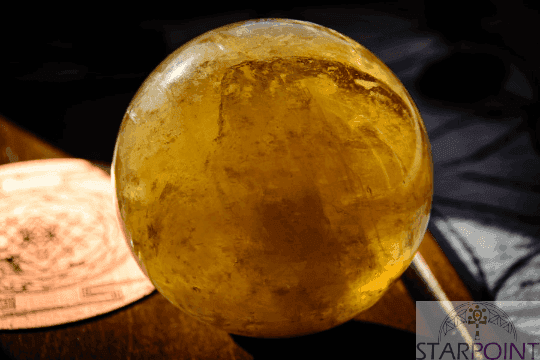 Gold calcite stimulates the will. Its energy particularly as crystal water is uplifting. It helps with meditation and inducing a deep state of relaxation and opens you to spiritual guidance. Gold calcite opens the higher mind. Calcite is one of the most common of all carbonate minerals and occurs predominately in sedimentary environments as a precipitate through evaporation of solutions, rich in calcium bicarbonate. Calcite can take many forms including rhomboidal or prismatic crystals, as compact granular mass*es such as onyx, limestone, or marble, in its fibrous form it is alabaster. 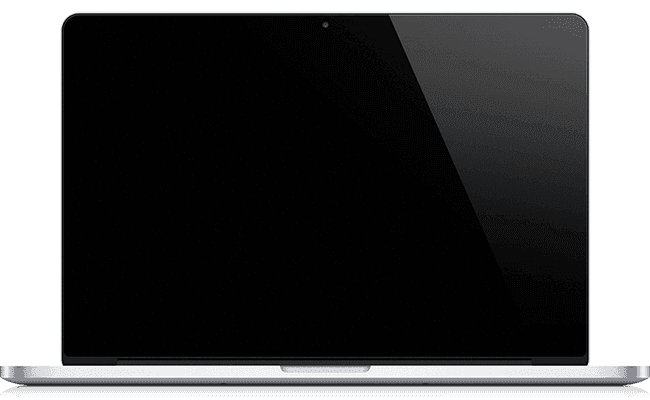 Colours include: colourless, grey, yellow, red, pink, orange, green, blue-brown and black. Calcite is also often fluorescent. Calcite is a powerful amplifier and cleanser of energy. By simply having a specimen of Calcite in a room will clean all negative energy and increase the households energy levels. It removes stagnant energy. Calcite is an active crystal that speeds up development and growth physically, mentally and spiritually. It is a spiritual stone linked to the higher consciousness that helps to open your higher awareness and psychic abilities. It increases spiritual development and allows the soul to remember. Calcite connects the emotions to the intellect there by creating emotional intelligence. Calcite brings hope and motivation into your life. It combats laziness helping you to become more energetic on all levels. Calcite calms the mind and teaches you how to analyse a situation and stimulates your ability to have insight into a situation, it also boosts your memory. It helps you to know instinctively which information is important to you at that moment. Calcite gives you the ability to change and idea into action. Calcite can help students to study more effectively. Calcite eases emotional stress and replaces it with serenity. 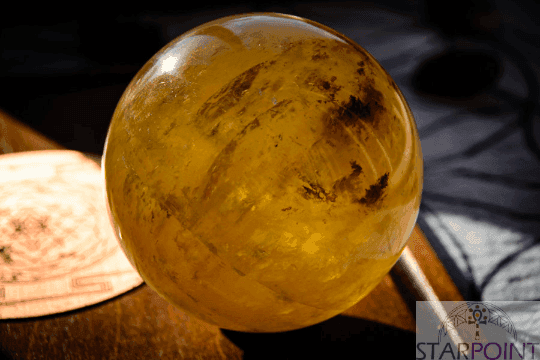 It is a stabilising stone, it increases trust your ability to trust in yourself and others. It helps you overcome setbacks that you may encounter on you path. Because of the variety of colours in calcite it will heal and energise all the chakras. Calcite cleans the elimination organs such as bladder, bowel, kidneys. It helps in the absorption of calcium but also dissolves calcification that builds up on broken bones and from arthritis. Calcite strengthens the skeleton and joints. It reduces intestinal and skin conditions enabling them to heal. It increases the blood clotting ability and tissue healing. It fortifies the immune system and encourage growth in undersized children. Calcite crystal water can be used on the skin to relieve ulcers wounds and warts.